My four-hour drive from Jodhpur to Jaisalmer, a three-hour drive from the Indo-Pakistan border, can be described as piquant. Think sepia shades and dusty trees against the glaring sunlight. Wild camels, domestic cattle, feral deer and sporadic clusters of huts resonate with everything that is quintessentially Rajasthani. And for the curious traveller who wonders what the coloured pieces of cloth tied to trees mean, these are offerings to the almighty by childless couples who wish for a son to fill their wombs. Jaisalmer has an airport, but political clashes have disbarred it from being functional. At first this sounds unfair. But live here three days and a change of opinion is a certainty. Maybe the city that is replete with stories, beliefs and tales, which make up its charm will risk its innocence if day-trippers inundated it in a snap. To preserve its simple charisma, travellers must make that effort to trek it to here. A lazy city, it deserves an equally laid-back walk-through. On stepping into the threshold of Jaisalmer, suddenly there is yellow everywhere, in hues, blending with the beige of its sand. People say that a few years ago an informal law advocated the use of locally mined kota, from where the city gets its colour. Since it can be easily excavated, it is a wise fiscal decision as opposed to importing construction bricks. Even the huts built from piling dried dung are plastered with paste made from this stone. While this is their quarried treasure, it is really the Habur limestone of which the locals are particularly proud – available everywhere, marketed as a healing stone. Reddish brown in colour with a dark black pattern, it is rich in fossil bacteria. This explains why milk turns to curd overnight when left in a glass moulded from the limestone. I’ve tried it myself and it does work very well indeed. Even one of the Jain temples inside the Jaisalmer Fort has a small rectangle of it oddly paved into the floor for reasons unknown. Apart from that, the temple is simply spectacular with carvings intact from an era that is believed to span between the 12th and 17th centuries. Unfortunately, these face the danger of vanishing soon due to negligence. The fort has been risking inevitable destruction for years now. Its initial dry construction – without the use of water or cement – which was built using an interlock system employing stones, didn’t fathom a growing colony to reside within. The sewage systems that leak directly into its very foundation are dated as well. The only logical next step calls for panicked renovations to save it from being swallowed into the land. While this is one issue that needs immediate tackling, its shoddy dealing with rubbish was a problem only up until last year. You can say the fort was disgracefully bedecked with garbage. Then came the birth of I Love Jaisalmer in February 2013, an inititative by Manvendra Singh Shekhawat, Managing Director, Suryagarh, which has garnered the support of the city’s denizens almost immediately. 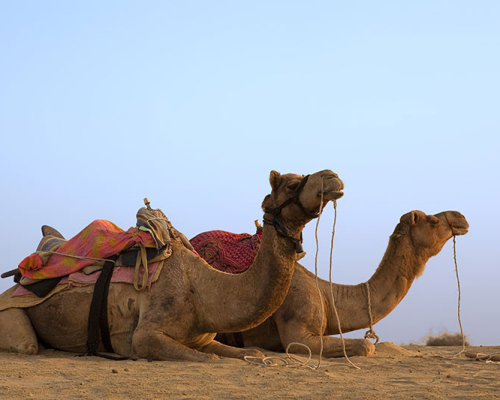 Its tidy-up drive continues to make a cleaner Jaisalmer more appealing to tourists. Each year the doors are closed for a few days so I Love Jaisalmer can run maintenance on the fort. They’re also in the process of collecting funds to fix the pipes some day. Today Jaisalmer Fort, known to be the only living one in the world, has spectacularly clean alleys and pathways that allow easy manoeuvring. The rising sun’s rays bounce off the crumbling walls, lending it a gilded tinge. It would be a shame to lose something so majestic to carelessness. The very pretext of its presence is alluring. Erudite mystic beings from centuries gone by believed its foundation spot to be blessed. From here rose a 25-storeyed tall structure to protect the flourishing Rajput families who used to occupy it. The blueprints were cleverly planned and survived many invasions. Its four gates are positioned such that unwitting invaders are blind to what lies at the next turn, weakening their attack. Secret passages are tucked in its many walls – pointed out easily by guides. A five-storied Tazia tower built by Muslim architects within this colony of sorts stands out with meshed screens and domed roofs. Old hanging balconies and handprints of widows immolated for sati are as they used to be. So is the prison at the external gates, outside which bodies of offenders used to hang. At first glance a tourist may mistake this to still be a working jailhouse. Walk closer and you will see students in cells, reciting off a blackboard, monitored by a tutor. I continue walking towards a hotel that promises a beautiful view of the city. For this I need to cut through the residential bits where I am suddenly taken aback by the large, vibrant paintings of Lord Ganesha on or around their doors. These are signed off with the date of the most recent wedding that has taken place in that home, as well as names of the bride and groom. If it is the home of the groom, his name is scribbled first, and if the bride was given away from that home, her name precedes the groom’s. Such is a custom that hopes for it to be a well-blessed arranged alliance between the families. Finally my climb to the peak opens into an overwhelming uninterrupted beige-gold panorama, completely free of the impersonal skyscrapers. It was easy to spot the periphery of Jaisalmer and look over the infinite Thar Desert. Adjust your vision to 90 degrees south, and a labyrinth filled with tiny houses and shops makes an interesting view. Walking deeper into these alleyways leads to another castle, an extension of the Jaisalmer Fort – Pata Ki Haveli. Technically the title means a diamond craftsman, but the occupant of this part was once an opium merchant. There isn’t much to see here, except to admire the detailing and visit textile shops in its interiors. In its courtyard are several puppet makers. Among them is the famous Dhannaram Bheel with his popular moustache that stretches to four and a half feet. His father, late Karnalal Bheel himself grew facial hair to the length of 283 cms and even made it to the Guinness Book of Records, so they say. It seems my walk keeps getting more fascinating to each progressing spot. As I continue on my way, my guide tells me about an annual government auction that awards the highest bidder the license to sell bhang and opium. While the bids’ winners may change, the most pursued opium dealer is only a skip from the fort. The owner hands me a menu that offers opium baked in cookies, dissolved in buttermilk, or consumed straight up. The drug seems to be an everyday fare for the locals, and accessed just as easily. The government controls its production, and its sale is intended for medicinal purposes. Not very shockingly, the supply exceeds more than medical demand. With a loophole in this law, shops easily trade poppy seeds that are very often brewed with tea. The day tour of Jaisalmer may as well end here, because the remaining bit of it is more gripping at night. The drive back from Jaisalmer Fort makes one quick stop at the cenotaphs though. Surprisingly, the Muslim and Hindu tombs share the same ground. The only distinguishing factor is rounded domes for Islam’s followers and peaks for the Hindus. The tradition was to place a sculpted statue or bust of the buried king/wealthy. With the progressing centuries, this has evolved into convenient photographs. Back at Suryagarh, and famished from all the walking, I am invited to join my hosts for a lavish lunch that works its way through an entire goat. I decline a few servings, only because I am told what part I’m about to devour. Towards the end we are served Jaisalmer’s famous lal maas, a mutton curry that I happily wolf down. With a stomach bursting for mercy, I’m forced to give it a short rest before my appointment at Suryagarh’s Reti Spa. Here I am scrubbed with warm oil and sand that instantly puts me into deep slumber. One siesta later it is time for the second part of my sightseeing. I am sent off on Suryagarh’s bespoke chudail trail – one that leads to haunted spots. With a brave face and a façade of confidence I hop into the car that drives me in complete darkness (because the streetlamps are dead) to the quieter side of Gadisagar Lake. Each and every hut on the kilometre-long bank is in darkness. They believe that at sunset any visible light will attract spirits of the immolated widows. Even today we can see stone pillars of the pyres. The number of figures etched on them indicates how many widows were set ablaze in that bonfire after the war. Some say on certain full moon nights, they can hear their shattering screams. We take our photos, and head towards our next destination. On the way we contemplate the possibility of the white figure in one of our photos to be that of a floating spirit. Goosebumps galore, we finally arrive at the abandoned Kuldhara village. This is where we actually feel the eerie chills freeze our spines. There are many versions of what had happened here. The simplest one tells us that this was once a Brahmin community. The chieftain’s daughter, known for her beauty, had caught the fancy of a powerful and cruel Muslim merchant. He insisted on taking her as his own, in spite of resistance. Afraid of a disgraceful abduction, the entire village decided to take off in dread. Since then, nobody has dared to set home here. They believe a death-curse looms over Kuldhara. The only inhabitants of the homes are bats. The temples remain untouched with their very ancient brass utensils and idols in place. Curbing the temptation to click a picture here would be a good decision, just so no bloodthirsty spirit is attracted to your camera’s flash. This short trip is about as spooky as spooky can get. On the way back, as if to assuage my rickety nerves, the much sought after nilgai make an appearance. There isn’t one, but a pair! These are large blue-grey Indian antelopes that are rarely ever sighted, and can be ferocious if approached. So we sit silently in the near distant shadows, observing their gallant gambol for a while before it is time for dinner. They don’t deem themselves to be just a hotel, but a representation of preserved traditions from years forgotten. Always eager to entertain, they take you on exciting bespoke experiences – time-travel through tales of the land, a rustic camel ride over the dunes, a play with bows and arrows like royalty did. It sure does feel like home, but in a surreal world with their inspired gardens, elegant courtyards, lakes and water bodies. Their kitchens revive inimitable Rajputana techniques, and the spa’s treatments give a sense of history massaging you into tranquility. Such is their hospitality, one that begs an encore.